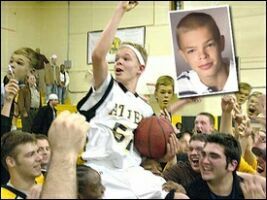 Jason McElwain, a senior at a Rochester, NY area high school, had a big night in February 2006. Jason was the basketball team's water boy for 4 years and the team's most enthusiastic supporter. In fact, his father was worried that his enthusiasm would go overboard and earn the team a technical foul. It was the last home game of the season, and the coach told him to suit up, to see how it feels. Then, with four minutes to go and the team ahead double digits, the coach put him in the game. His teammates fed him the ball for 3-point shots, which apparently he practiced a lot. His first shot an "air ball," as Jason later described it  missed by a mile. Then he tried a layup, which he also flubbed. The coach said he put his head in his hands, praying he'd done the right thing for Jason. Then the 3rd went in, and everyone cheered. As did 4th, the 5th, 6th, 7th and 8th! The audience and team were going wild. And just before the buzzer, Jason's 9th shot went in! The team and the students in the bleachers flooded onto the court. A couple of the players lifted Jason onto their shoulders and paraded him around. Coach Jim Johnson, when he was interviewed, said: "I couldn't stop crying." His mother, Debbie McElwain, said: "This is the first moment Jason has ever succeeded and been proud of himself." In March, President Bush met with Jason, his parents and his coach, who waited on the tarmac for the President to come down the steps of Air Force One. 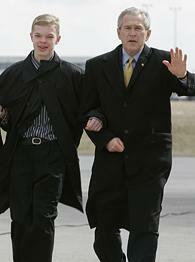 Jason walked arm-in-arm with his mother on one side and Bush on the other to a waiting group of reporters. When asked by a reporter, Bush said: "I wept, just like a lot of other people did," as McElwain beamed beside him. At the end of the press conference, Jason said to the President, "It was an honor to meet you." The President replied, "No, my honor." Jason could have run off the court after missing his first shot by a mile, or could have given up after missing his layup. But he stuck with it. He let go of the ego of embarrassment, the fear of ridicule  and that's when the magic occurred.